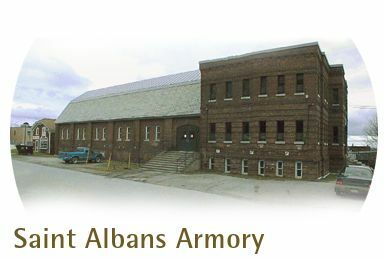 The Armory in Saint Albans is situated in the center of the city adjacent to Taylor Park on the corner of Fairfield Street and Hospital Drive on a lot approximately .3 of an acre. The structure is standard red brick with brick and stone detailing. Interior wall varies from plaster to stud/drywall. The flooring varies from resilient tile in the office areas to wood in the drill hall and concrete in the basement. The building is fully sprinkled and has visual and audible fire alarms.